[PDF] International Human Rights Law: Six Decades after the UDHR and Beyond | Free eBooks Download - EBOOKEE! 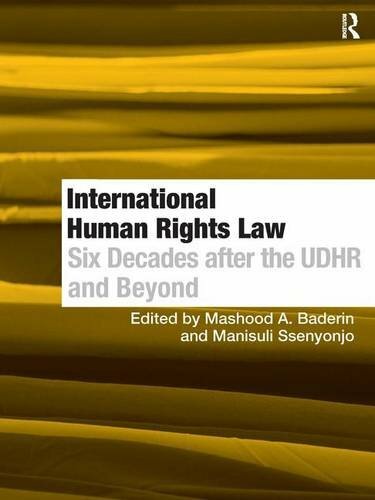 Description: This timely and valuable book explores the development of international human rights law over the last six decades. The volume brings together leading experts to reflect on different aspects of human rights law, not only considering and evaluating the developments so far, but also identifying relevant problems and proposing relevant possible perspectives for the continued positive future development of human rights law. The book is international in perspective, both in scope and context, and covers developments in the international protection of human rights since the adoption of the UDHR in 1948. The developments considered include the United Nations system of protecting human rights as well as regional human rights systems in Africa, America and Europe. It also considers some key themes relevant to human rights including globalisation, protecting human rights in emergency situations and trade sanctions, the development of human rights NGOs, and many others. The book will be an invaluable resource for students, academics and policy-makers working in the field of international human rights. No comments for "[PDF] International Human Rights Law: Six Decades after the UDHR and Beyond".